Okay, so here's the first "exotic" I was able to snap in the neighborhood. 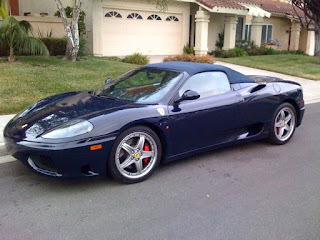 Why it's a Ferrari 360 Spider. 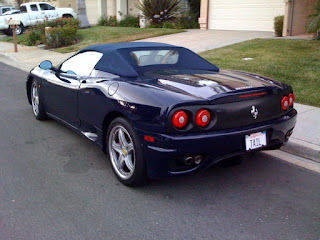 Overall I'm much more of a Porsche guy, but you don't see rolling scuplture from Maranello in our "working class" (ha!) neighborhood every day. And it's refreshing to see a Ferrari in a shade other than arrest-me-red. Note the (okay, I'm going out on a limb here with the assumption) guy's vanity plate. TAIL. 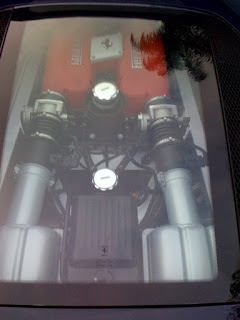 My favorite design element - a beautiful 3.6l Italian V8 under glass. No crappy plastic shrouds covering this masterwork. The only thing better - the symphonic exhaust note.